Perform a scoping study to determine the preferred alignment, estimates, and potential phases of a new facility (Central Parkway) to improve mobility through Boone County. The route should connect Camp Ernst Road at KY 237 (Pleasant Valley) to Verona. 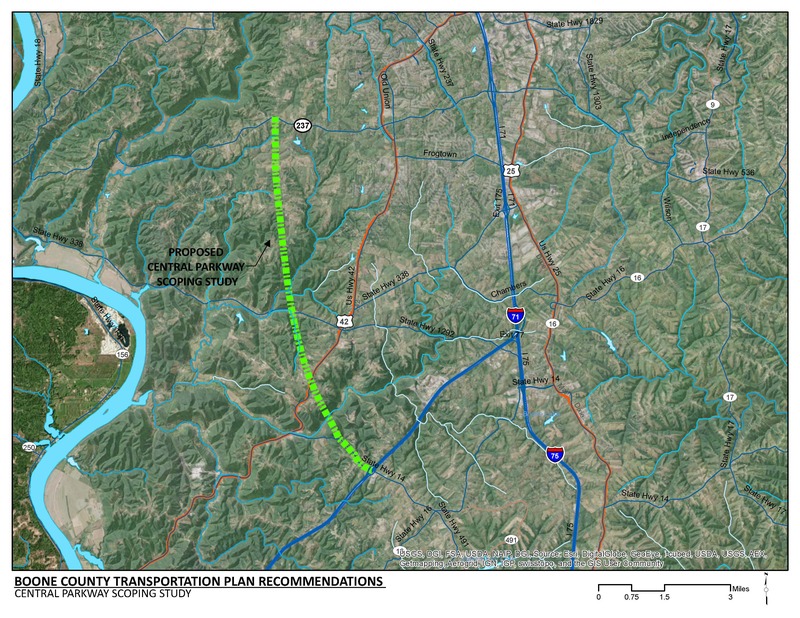 The recommendation to improve KY 14 (from I-71 to US 42) could be considered as an initial phase of this project. A contiguous north-south route would improve north-south mobility through central Boone County. By improving mobility, travel demand on existing north-south arterials such as US 42 and I-71/75 will be reduced. The new route will provide access to future development in central Boone County. The proposed roadway will likely require multiple phases of implementation due to funding. Phases with standalone benefits and logical termini will be identified as part of this study. Portions of central Boone County are environmentally sensitive. The study will consider alignments that minimize impacts to these areas. There are several streams that run through central Boone County. The Central Parkway alignment will likely require structures to cross these streams. Coordination with the Boone County Planning Commission will be necessary to align with future land uses and development through the central portion of the County. Currently north-south mobility in Boone County is limited. North-south arterials through the County, including US 42, US 25 and I-71/75 are congested. By year 2040, traffic on US 42 is expected to increase by over 50,000 vehicles per day. Without improved mobility or capacity, this will significantly increase travel delay on an already congested roadway. The land use forecast for 2040 shows new suburban density housing through the central portion of the County. However, many of the roadways through this portion of the County are not designed to support this type of land use. By year 2040, population through central Boone County is expected to increase by over 10,000 homes. Multi-modal provisions should be considered, to continue Boone County’s goal of improved pedestrian and bicycle safety and connectivity.